Clusters foster an integrated approach to governance that is aimed at improving government planning, decision-making and service delivery. The main objective is to ensure proper coordination of all government programmes at national and provincial levels. The Presidency has announced newly-constituted Ministerial clusters, as part of the process of improving coordination within government and enhancing the delivery of services. The main functions of the clusters are to ensure the alignment of government-wide priorities, facilitate and monitor the implementation of priority programmes and provide a consultative platform on cross-cutting priorities and matters being taken to Cabinet. The clusters of the Forum of South African Directors-General (FOSAD) mirror the Ministerial clusters. The FOSAD clusters provide technical support to the Ministerial clusters. The Director-General in The Presidency, Cassius Lubisi, is the chairperson of FOSAD. The ACIRC, a temporary standby force capable of responding quickly to crisis situations in Africa, is expected to be operational by October, South African President Jacob Zuma said at the conclusion of his working visit to Malabo, Equatorial Guinea, last week. The ACIRC will serve as an interim measure ahead of the establishment of a permanent African Standby Force, which was originally expected to be operational by 2015. 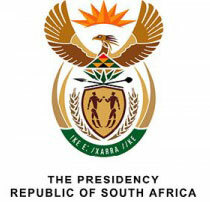 President Zuma proposed the concept of the ACIRC at last year's African Union (AU) Summit in Addis Ababa, Ethiopia, where the proposal was endorsed. He said the countries that had volunteered to contribute resources to the ACIRC met during the recent AU Summit to discuss the state of readiness of the temporary standby force. "The AU Commission concluded its verification visits to the contributing countries and presented a report on the framework for the operationalisation of the ACIRC, which was endorsed by the contributing countries," Zuma said. "It is expected that the ACIRC will be launched by October 2014." The AU envisions the ACIRC as an efficient, robust and credible force that can be deployed rapidly, either conducting operations of limited duration and aims, or paving the way for the deployment of larger AU and/or United Nations peace operations. In May last year, South Africa, Ethiopia and Uganda were the first to support the initiative and pledged to provide troops should the need arise. 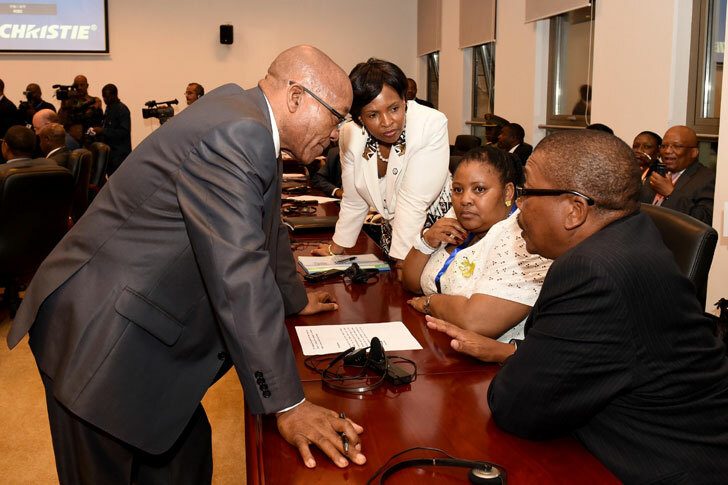 President Zuma is confident that the cordial relations between South Africa and Mauritania will be further strengthened during the second term of President Abdel Aziz. 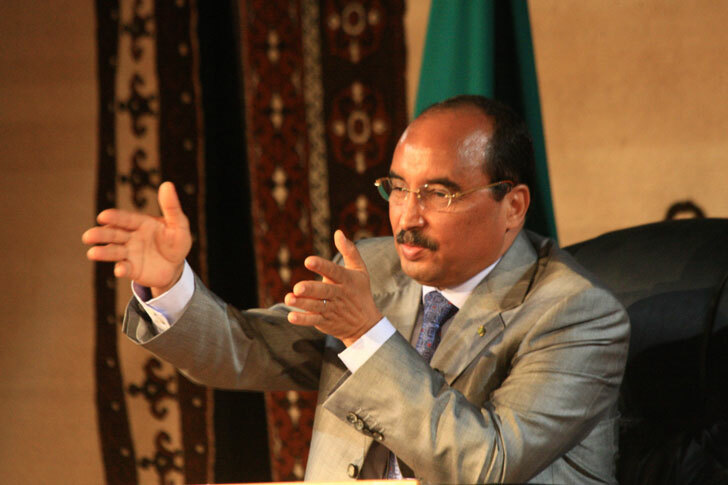 The President of the Republic of South Africa, Jacob Zuma, has congratulated the President-Elect of the Islamic Republic of Mauritania, Mohamed Ould Abdel Aziz, on his successful re-election following the Presidential Elections in Mauritania on 21 June 2014. President Zuma also praised the people of Mauritania for their peaceful demeanour during the Presidential Elections. To this end, President Zuma said the South African Government wished for continued peace, stability and prosperity for the people of Mauritania. The report showed that foreign direct investment (FDI) inflows to South Africa jumped from US$4,5 billion in 2012 to a record-high $8,1 billion in 2013, with investments in infrastructure being the main attraction. 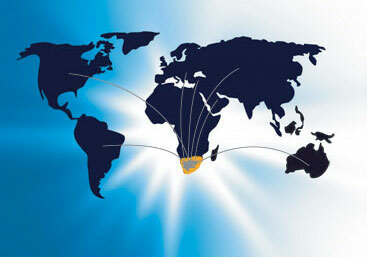 South Africa was Africa's best FDI performer in 2013, topping the charts for both inflows and outflows of FDI and leading the trend towards increasing intra-African investment, according to the United Nations Conference on Trade and Development's (Unctad's) latest World Investment Report. This put South Africa on top of the table for FDI inflows into Africa, followed by neighbouring Mozambique, Nigeria, Egypt and Morocco. At the same time, South Africa's FDI's outflows almost doubled, from $2,9 billion in 2012 to $5,6 billion in 2013, powered by investments in telecommunications, mining and retail. Angola was Africa's next-biggest investor, followed by Nigeria, Sudan and Liberia. In all cases, Unctad's report found outward investment flows were directed mostly to other countries on the continent, paving the way for investment-driven regional integration. The event was hosted by ESASTAP Plus, a joint initiative of South Africa's Department of Science and Technology and the European Commission's Directorate-General for Research and Innovation, aimed at strengthening technology, research and innovation cooperation between Europe and South Africa. It also marked 20 years of freedom in South Africa. 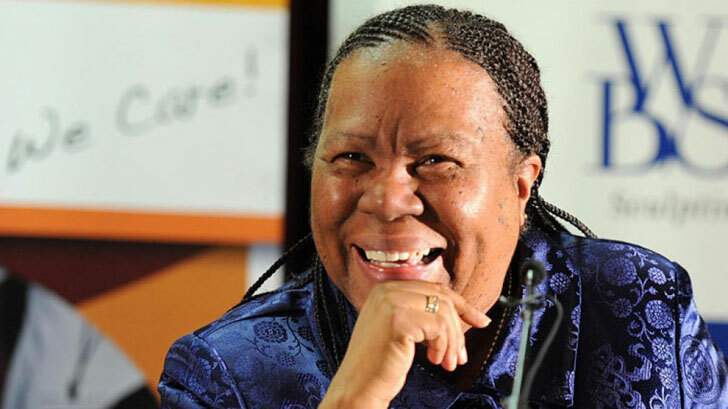 The Minister of Science and Technology, Naledi Pandor, has told South Africa's European partners that South Africa has to share its science and technology knowledge with the rest of Africa. "We don't want to be an island of innovation in a sea of technology poverty," Minister Pandor said at a dinner last week on the sidelines of the EuroScience Open Forum in Copenhagen, Denmark. Minister Pandor said South Africa had to work to raise the levels of science and technology all over the continent. The Minister thanked South Africa's European partners for their ongoing collaboration and support in various fields, and said she looked forward to South Africa's science, technology and innovation partnership with Europe being taken to new heights and expanding across Africa. Africa's involvement in the Square Kilometre Array project was also highlighted during dinner. The project is an international effort to build the world's largest radio telescope, which will have a collecting area of one square kilometre (or one million square metres). "South Africa is Canada's most important commercial and political partner in Africa and is the only country in Africa – and one of only 20 around the world – to be identified by our government's recent Global Markets Action Plan as an 'emerging market with broad Canadian interests'," Fast said. Canadian trade finance agency Export Development Canada will open its first African office in Johannesburg in 2015, Canada's Minister of International Trade, Ed Fast, announced recently. Fast said Canada had chosen Johannesburg as the location for its first Export Development Canada office because of the city's economic position as the financial gateway to southern Africa. Johnston said the success of the Canadian-designed Gautrain demonstrated both the quality of South African infrastructure and the strength and expertise of Canadian technology. There were several areas in which South Africa and Canada could cooperate, including mining, infrastructure, agriculture and education, he said, adding that the success of Africa was critical to the success of the world. Co-hosting the forum provided a platform to focus on the importance of strengthening maternal, infant and child health in South Africa and to mobilise all sectors of society to contribute to this effort. South Africa co-hosted a Partnership Forum Meeting with the Partnership for Maternal, Newborn and Child Health at Sandton Convention Centre, Gauteng, from 30 June to 1 July 2014. The partnership is a global organisation hosted by the World Health Organisation. The release of the Global Countdown on how the world is doing in meeting the millennium development goals 4 and 5 also enabled the participants from health and non-health sectors to take stock of progress and learn lessons. It also promoted greater accountability and responsibility towards women, newborns, children and adolescents, enabling them to realise their right to the highest attainable standard of health in the years to 2015 and beyond. 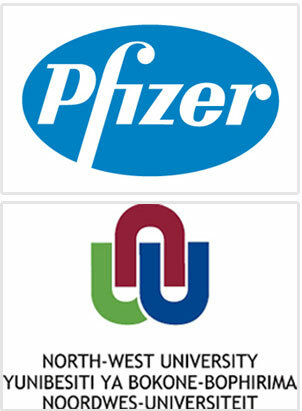 US pharmaceutical giant Pfizer is set to partner with South Africa's North-West University (NWU) in preclinical research, a key field in the development of new drugs, following the signing of a memorandum of understanding between the company and the university last week. According to a joint statement, the partnership could include the use of Pfizer's genetically modified animal models for testing the safety and efficacy of a range of new drugs, including treatments for cancer, heart disease and immune system disorders. Joint research projects will be conducted at NWU's Preclinical Drug Development Platform, a state-of-the-art facility with a permanent staff of 14 scientists that functions as a national study platform, supplying researchers across South Africa with the infrastructure for preclinical studies. The facility was established, and is largely financed, by the Department of Science and Technology to enable a faster, more efficient drug discovery process in the country. The memorandum of understanding was signed by the facility's director, Anne Grobler, and Pfizer's Gabriela Cézar, at Pfizer's R&D site in La Jolla, California. This year’s WDCD was commemorated under the theme: “Land Belongs to the Future, Let’s Climate Proof It”. The theme highlights the benefits of mainstreaming sustainable land management policies and practices into our collective response to climate change. 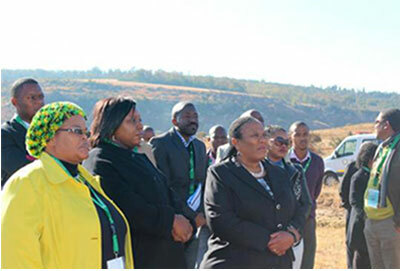 The Deputy Minister of Environmental Affairs, Barbara Thompson, on Friday, 27 June 2014, led the commemoration of the WDCD in Ladybrand, Free State. The WDCD is an annual United Nations (UN) event aimed at promoting public awareness on the issue and the implementation of the UN Convention to Combat Desertification in those countries experiencing serious drought and/or desertification, particularly in Africa. Desertification is land degradation in dry lands that affects biological productivity as well as the livelihoods of millions of people. It is caused by a combination of human and natural factors that contribute to an unsustainable use of natural resources which include soil, water, air, vegetation, solar and wind energy. SKA South Africa funded the research leading to the discovery, which has been published in the scientific journal Nature. Cape Town astronomer Roger Deane and a team of South African-funded researchers have discovered a trio of closely orbiting supermassive black holes in a galaxy more than four-billion light years away – confirmation of the country's fast-growing expertise in the field of radio astronomy. 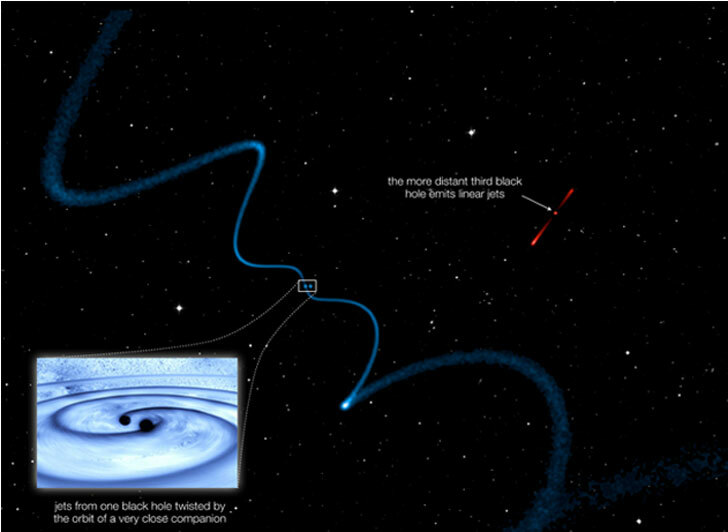 The discovery of the triple black hole system, the tightest trio of black holes known to date, "is remarkable since most galaxies have just one at their centre" and suggests that closely packed supermassive black holes are far more common than previously thought, Square Kilometre Array (SKA) South Africa said in a statement. 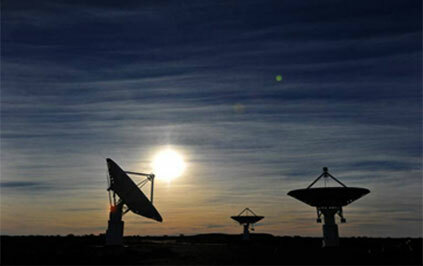 "Four South African institutions – the Universities of Cape Town and the Western Cape, as well as Rhodes University and SKA South Africa – are represented by the research team, which is a very positive confirmation of the dynamic and significant radio astronomy which has developed rapidly in South Africa," SKA SA project director Bernie Fanaroff said in a statement. The new buffer zone is the result of a long consultation process involving land owners, community representatives, non-governmental organisations, mining companies and various government stakeholders. At its recent meeting, Cabinet welcomed the approval of a new buffer zone for the Mapungubwe World Heritage Site by the World Heritage Committee of the United Nations Educational, Scientific and Cultural Organisation (UNESCO), which held its 38th Session in Doha, Qatar, from 15 to 25 June 2014. The approval of this new buffer zone is a welcome development for South Africa’s efforts to improve the management and protection of its world heritage sites while allowing for responsible and sustainable development. Mapungubwe was declared a World Heritage site by the UNESCO in July 2003. Mapungubwe is set against the northern border of South Africa, joining Zimbabwe and Botswana. It is an open, expansive savannah landscape at the confluence of the Limpopo and Shashe rivers. It was the centre of the largest kingdom on the sub-continent before it was abandoned in the 14th century. The Mapungubwe Cultural Landscape demonstrates the rise and fall of the first indigenous kingdom in southern Africa between 900 and 1 300 AD. 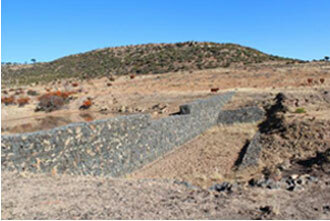 The core area covers nearly 30 000 ha and is supported by a suggested buffer zone of around 100 000 ha. The Mapungubwe site and buffer zone are legally protected, meaning that mining or prospecting will be completely prohibited from taking placing within the property and the buffer zone. Any development with a potential impact on the property will be subjected to an environmental impact assessment. SANParks is the management authority for the property and provides overall management involving coordinating government and local community efforts to conserve the site. 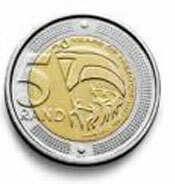 The coin has the “20 Years of Freedom” logo depicted on the reverse side instead of the usual image of the wildebeest on the bi-metal R5 coin. The South African Reserve Bank (SARB) will issue a commemorative circulation R5 coin celebrating 20 Years of Democracy in South Africa. 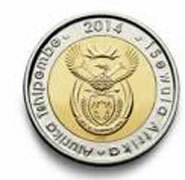 The obverse of the coin depicts the South African Coat of Arms, the year of issue (2014), with “South Africa” written in Tshivenda (Afurika Tshipembe) and in isiNdebele (iSewula Afrika). SARB said in a statement. 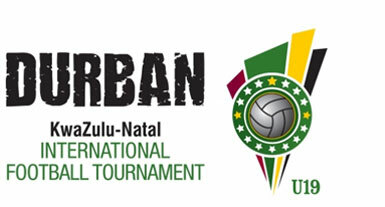 The Durban Under-19 International Football Tournament, backed and jointly organised by KwaZulu-Natal, the City of Durban and the South African Football Association, will take place annually in Durban for at least the next three years. A South African under-19 side will lock horns with junior teams representing some of the giants of international club football at the first edition of a new youth tournament kicking off in Durban on 31 July, the KwaZulu-Natal Provincial Government announced recently. The province said in a statement that a specially formed South African under-19 national side, under the watchful eye of former Bafana Bafana coach Ephraim "Shakes" Mashaba, would compete in the tournament along with teams from Santos (Brazil), Boca Juniors (Argentina), Everton (England), Benfica (Portugal), Feyenoord (Netherlands) and Roma (Italy). The format departs from the traditional standard, under which junior international teams compete at under-17 and under-20 level. Durban's Sugar Ray Xulu Stadium, a training venue for the 2010 FIFA World Cup, and Princess Magogo Stadium, a Premier Soccer League (PSL) venue, will host the tournament's group stage matches.